Whether a Chevy Equinox, Cavalier, or Chevy Colorado, driving a Chevrolet is easy and enjoyable. Perhaps this is the reason they are among the most popular cars, trucks, and SUV’s on the road. When you need Chevrolet service, our certified auto technicians are fully-trained to provide proper mechanics the first time, every time. And if you need Chevrolet repair, our NAPA® authorized auto care center will get your vehicle back on the road safely, and at a price you can afford. 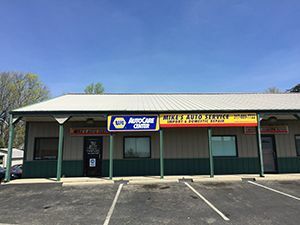 We offer a wide range of auto care services in Greenwood, Indiana, including scheduled car maintenance, minor repairs, major repairs, parts replacements, and much more. No matter how big or small your Chevrolet problem is, we can solve it in a convenient time frame that’s convenient for you! As a family owned and operated business, nothing means more to us than our client’s complete satisfaction and safety. We take the time to listen to our customers’ concerns, and use a concentrated approach to accurately diagnose and repair all Chevy model vehicles. It is important to us that your Chevrolet repair needs are met, and your customer service needs are exceeded! Give us a call today at 317-889-7722 to schedule an appointment, or to request a quote for Chevy repair. Don’t forget to ask us about our new customer discounts too!